American soldiers who entered Germany at the end of World War 2 made the liberating of POW camps a priority. At camp after camp, they found stockpiles of fluoride stored near the water supply. When they asked what the fluoride was used for, they were told that the Germans used the substance as an additive to the prisoners water, to make them docile. 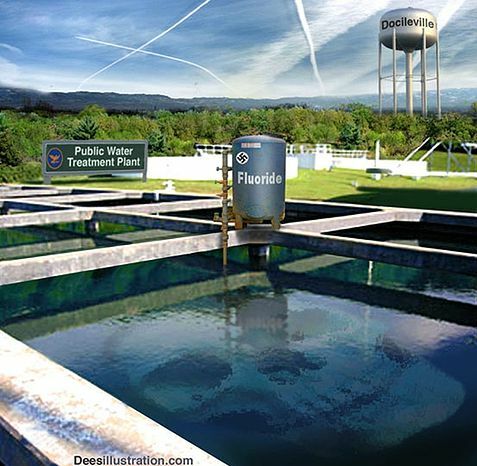 This is the first known incidence of intentionally fluoridating drinking water. Within a few years, most of the drinking water in the United States had been fluoridated, in the interests of preventing tooth decay. All of our major brands of toothpaste contain fluoride. Most beverages and foods contain sodium fluoride. This is not a naturally-occurring phenomenon – it is intentionally introduced. The most important question becomes “does fluoride do what it claims to do – prevent tooth decay?” The answer is that it does not. Not only is there no proof that fluoride prevents tooth decay, there is powerful evidence to the contrary. The largest study ever taken on the matter was conducted in Tucson, Arizona in 1992. 26,000 elementary school students were involved in the study, which produced empirical evidence that the more fluoride a child consumes, the more cavities will appear! The study was conducted by the University of Arizona under the supervision of world-renowned Professor Emeritus Cornelius Steelink. Of course, most of the countries on Earth rejected fluoridated water years ago. Only the United States and a small handful of countries under our influence continue to add this toxin to their public drinking water supplies. China discontinued the practice after finding that fluoride in the water lowers the ability of children to learn. There is also scientific evidence that osteoporosis, Alzheimers Disease, and other aluminum-related diseases are caused by fluoride – an aluminum by-product. So, what is fluoride anyway? First of all, it needs to be stated that the ‘substance’ referred to as ‘Fluoride’ is a misnomer – there is no such substance listed in the periodic chart of the elements, nor in the prestigious CRC handbook, nor in the sacred ‘bible’ of the pharmaceutical industry – the illustrious ‘Merck Index’. Instead, we find a GAS called Fluorine – and from the use of this gas in various industries such as aluminum manufacturing and the nuclear industry certain toxic by-products are created which have ‘captured’ fluorine molecules. One such toxic, poisonous ‘by-product’ is called sodium fluoride – which according to the Merck Index is primarily used as rat and cockroach poison and is also the active ingredient in most toothpastes and as an additive to drinking water. The proof that it is a toxic poison can be found by reading the warning label on any tube of toothpaste. Sodium Fluoride is also one of the basic ingredients in both Prozac and Sarin Nerve Gas, as well as a host of anti-depressant drugs and commercial insecticides. Sodium Fluoride is a hazardous waste by-product of the nuclear and aluminum industries. In addition to being the primary ingredient in rat and cockroach poison, it is also a main ingredient in anaesthetic, hypnotic, and psychiatric drugs as well as military nerve gas! Historically, this substance was quite expensive for chemical companies to dispose of, but in the 50’s and 60’s Alcoa and the entire aluminum industry – with a vast overabundance of the toxic waste – sold the FDA and our government on the insane but highly profitable idea of buying this poison at a 20,000% mark-up and then injecting it into our water supply as well as into the nation’s toothpaste. When sodium fluoride is injected into our drinking water, its level is approximately 1 part-per-million (ppm), but since we only drink ½ of one percent of the total water supply, the hazardous chemical literally goes down the drain. The chemical industry has not only a free hazardous waste disposal system – but we have also paid them millions of dollars in the process. Independent scientific evidence over the past 50 plus years has shown that sodium fluoride shortens our life span, promotes various cancers and mental disturbances, and most importantly, makes humans stupid, docile, and subservient, all in one neat little package. Honest scientists who have attempted to blow the whistle on fluoride have consistently been professionally black-listed, and their valid points never have received the ink they deserve. In 1952 a slick PR campaign rammed the concept of ‘fluoridation’ through our Public Health departments and various dental organizations. This slick campaign was more akin to a highly emotional “beer salesman convention” instead of the objective, scientifically researched program that it should have been. It has continued in the same vein right up to the present day – and now sodium fluoride use has now become ‘usual and customary’. There is a tremendous amount of emotion attached to the topic of fluoride usage – but I can’t find even one objective, double blind study that even remotely links fluoride to healthy teeth at any age. Instead, I hear “9 out of 10 dentists recommend ‘fluoride’ toothpaste”. Truly independent scientists who’ve spent a large portion of their lives studying this subject have been hit with a surprising amount of unfair character assassination from strong vested-interest groups who profit from the public’s ignorance and illnesses. a doctor says I have a touch of alzhiemers. a copy of your book! WTF? This needs to stop! Citation for the point about fluoride and the Nazis? That’s an urban myth, even anti-fluoridationists admit that. Please provide some links to your sources. Fake. Opponents of fluoridation have now earned a spot alongside UFO-believers or Bermuda Triangle-believers. The Skeptic’s Dictionary has spoken!